Amorphophallus titanum known as the titan arum, is a flowering plant with the largest unbranched inflorescence in the world. The titan arum's inflorescence is not as large as that of the talipot palm, Corypha umbraculifera, but the inflorescence of the talipot palm is branched rather than unbranched. Due to its odor, which is like the smell of a rotting animal, the titan arum is characterized as a carrion flower, and is also known as the corpse flower, or corpse plant. For the same reason, the title corpse flower is also attributed to the genus Rafflesia which, like the titan arum, grows in the rainforests of Sumatra, Indonesia. The flower produces strong, horrible smell of decaying meat. It is a very rare flower, bloom only for two, three days and reappear only after years. One corpse flowers can be 3 meters in height. The corpse flower has a large bract and a long spike inside it. The foul smell of the flower last for 12 hours. The intense smell of the plant also attracts pollinators like carrion flies. Rafflesia arnoldii is a member of the genus Rafflesia. It is noted for producing the largest individual flower on earth. It has a very strong and horrible odour of decaying flesh, earning it the nickname "corpse flower". It is endemic to the rainforests of Sumatra and possibly Borneo. 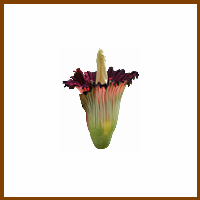 Although there are some plants with larger flowering organs like the titan arum and talipot palm, those are technically clusters of many flowers. This parasitic plant can only found in rainforests of Sumatra and Borneo. It is a leafless and rootless plant. The Rafflesia arnoldii is known for its strong decaying flesh like smell. One Rafflesia arnoldii can be 1 meter diameter and 11 kg in weight Unlike other plants the Rafflesia arnoldii has no chlorophyll. So that the plant can’t perform photosynthesis. It parasite on tetrastigma plants. And these flower are known to be nearing extinction. Hydnora africana is an achlorophyllous plant in the family Hydnoraceae, native to southern Africa that is parasitic on the roots of members of the Euphorbiaceae family. The plant grows underground, except for a fleshy flower that emerges above ground and emits an odor of feces to attract its natural pollinators, dung beetles, and carrion beetles. The flowers act as temporary traps, retaining the beetles that enter long enough for them to pick up pollen. It is also called jackal food.Hydnora africana has a very strong and unpleasant smell. This smell is generated from the osmophores, which is a white spongy area in the inner surface of the tepals that eventually changes color to grey. Osmophores were first called "bait bodies" by Harmes. Burger et al. concluded that the odor is made up of dimethyl disulfide and dimethyl trisulfide. These odors are also found in dead-horse arum. Bulbophyllum phalaenopsis is a species of orchid in the genus Bulbophyllum. Its flowers' fragrance is that of rotting meat that attracts flies which pollinate them. The Bulbophyllum Phalaenopsis is the worst smelling orchid in the world. It is native to New Guinea island. The bulbophyllum phalaenopsis is one of largest orchids in the world and bloom year around. The hairy, pinkish-red flowers app eras in clusters. In addition to the intense, unpleasant smell this orchid is also known for its long leaves, can reach up to a length of 4 feet. Dragon Arum is endemic to the Balkans, extending as far as Greece, Crete, and the Aegean Islands, and also to the south-western parts of Anatolia. The dragon arum is an impressive plant that found in rocky and hilly areas of the Mediterranean basin. The plant is also known as black arum, snake lily, dragonwort, stink lily and vondoo lily. The plant grows to a height of 1 meter. The large, showy, maroon-purple flower appear in late spring. The flower can be 80 cm in length. But this beautiful flower smells like a rotting meat and it attracts pollinating insects. The flower also has a long tail like spike. Stapelia gigantea is a species of flowering plant in the family Apocynaceae, native to south eastern Africa. Growing to 20 cm tall, it is a clump-forming succulent with erect green stems 3 cm thick. The starry pale yellow colored flowers resemble starfish. It is also called as African starfish. In summer, large star-shaped five-petalled flowers up to 35 cm in diameter are borne. The flowers are red and yellow, wrinkled, with a silky texture and fringed with hairs. They have the smell of rotting flesh, in order to attract the flies which pollinate them. The plant is commonly referred to as Zulu giant, carrion plant or toad plant. Stapelia gigantea sometimes also goes by the name of Stapelia nobilis or Stapelia marlothii. Symplocarpus foetidus, commonly known as skunk cabbage or eastern skunk cabbage (also swamp cabbage, clumpfoot cabbage, or meadow cabbage, foetid pothos or polecat weed), is a low growing, foul-smelling plant that grows in wetlands. The plant grows in swampy, wet soil across North America and Asia. The Western skunk cabbage bloom in spring. At first a shell-like part of the plant called ‘spathe’ comes out of the ground before the leaves. It is brownish-purple in color and can grow up to a size of 4-6 inches. It produce a strong, unpleasant smell and attracts pollinators like bees and butterflies. Lysichiton americanus, also called western skunk cabbage, yellow skunk cabbag, American skunk-cabbage or swamp lantern, is a plant found in swamps and wet woods, along streams and in other wet areas of the Pacific Northwest, where it is one of the few native species in the arum family. Western skunk cabbage is named after the skunky smell produce by its flowers. This plant grows in swamps and woodlands of Alaska, California, Idaho, Washington, Montana and Oregon. The Western skunk cabbage bloom in early spring and winter. The rod shaped flowers have bright yellow color. They grow to a height of 40 cm. The skunky smell of this plant attracts scavenging flies as pollinators. Arum dioscoridis is a plant of the arum family (Araceae). In winter appear green, arrow-shaped leaves. In spring, the short-stalked inflorescence appears consisting of a black, rod-shaped spadix (spadix) surrounded by a yellow-green, purple mottled brown or even purple bract (spathe). The female flowers are located at the bottom of the spadix, above are the male flowers and the top is a sterile area (Appendix). The spadix spread a pungent smell that attracts flies as pollinators. The plant is native to forests in the east of the Mediterranean in southern Turkey, Cyprus and the Middle East. The plant can be propagated by means of seeding. The carob tree is native to the Mediterranean region, including Southern Europe, Northern Africa, the larger Mediterranean islands, the Levant and Middle-East of Western Asia into Iran; and the Canary Islands and Macaronesia. The carob tree is a medium-sized evergreen tree that grows in warm and subtropical regions around the world. The name ‘carob’ refers to the edible fruit of the tree. The carob pod contains many nutrients such as Vitamin A, B2, B3, magnesium, calcium and iron. Even though the fruits are nutritious and flowers of carob tree smell like sperm. The small spirally arranged flowers appear in autumn. The male and female flowers appear on different trees. It is the male flowers that produce worst sperm like smell on bloom.